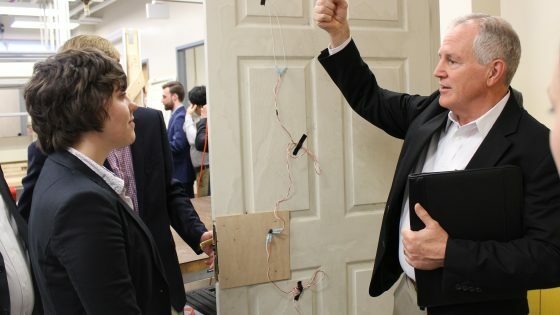 Each semester mechanical engineering seniors are given a real world problem to solve in the MAE 416 Capstone Design course, and they showcased their solutions during Senior Design Day. 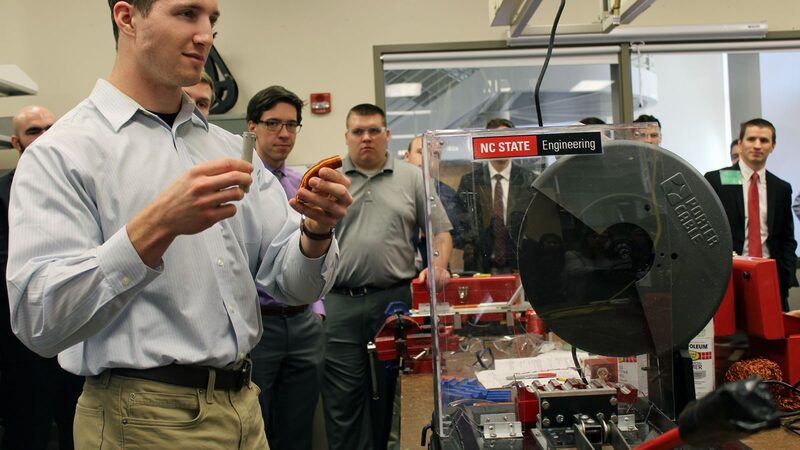 This semester long project is designed to prepare students for the workplace through hands-on experience in the design and prototyping of real world solutions to industry sponsored projects. The event starts in the morning with formal presentations where each team outlines their design process, describes the proposed device, and advocates for how their work has satisfied the project goals and constraints. 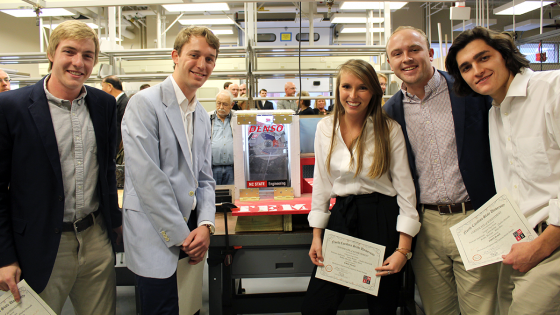 This semester’s projects were provided by our sponsors, DENSO and ALoft Raleigh Hotel. The students participating for DENSO were challenged with the task of being able to separate a copper coil from a plastic tube as part of a recycling need. The ALoft challenge: improve the current closure mechanism used on hotel doors. Each sponsor evaluated 6 unique team solutions to their project. The DENSO project was advised by Dr. Chau Tran while Dr. Scott Ferguson advised the Aloft project. Our senior design shop manager, Gary Lofton, works tirelessly to assist the students safely learn the shop fabrication techniques necessary to successfully build their machines. After presentations are complete, everyone breaks for the annual Burger Bash lunch provided by ASME. Then it’s right back to the action as the student groups demonstrate the designs for their sponsor. 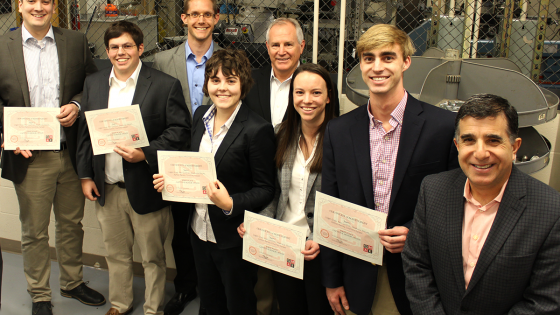 The top three teams for each project are recognized by the sponsors with certificates and a monetary award. This year, DENSO awarded “The Temper Tran-Trums” team first place, and ALoft gave first place to “Team 1”, proving they’re number one for a reason.